Ever year we manage to produce some crops over the winter. We extend the pepper season by bringing some of the plants indoors (and hopefully keep them going over the winter to fruit again next summer); we grow kale and purple sprouting broccoli; we plant leeks (unless, like last year, a family disaster intervenes); and we grow oca, which is harvested as the days grow shorter and into the early winter. This year, however, I have decided to try to make more effort, so I have also sowed winter lettuce and miners lettuce (Claytonia) seeds to give us fresh salad leaves over the winter, plus we have salsify and root parsley coming along nicely. However, my big experiment this year is with oriental vegetables. 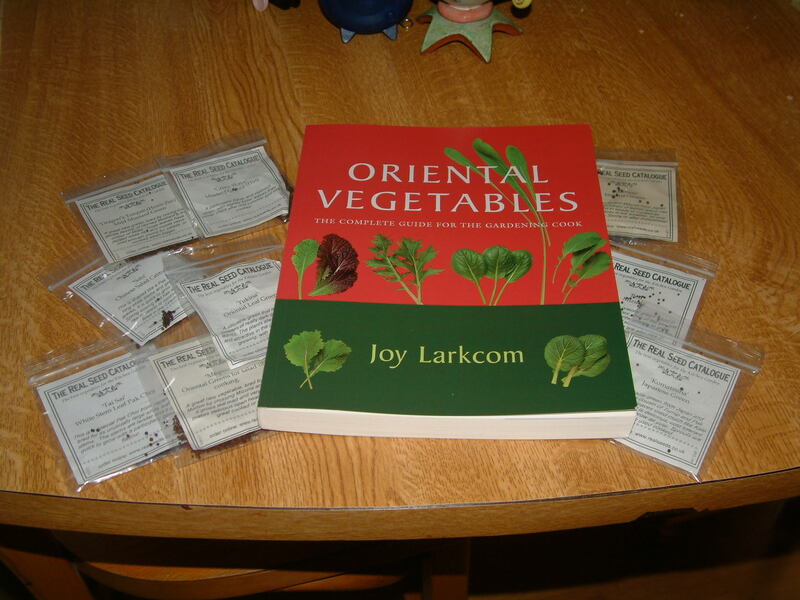 I have recently bought a copy of Joy Larkcom’s Oriental Vegetables: the complete guide for the gardening cook. It’s my perfect book really, not only does it have information about cultivation, it’s also got history of the different vegetables plus recipes. As usual, I decided to buy my seeds from The Real Seed Catalogue, but in this case felt somewhat overwhelmed by the choice, so I plumped for their Oriental Explorer pack. I’m experimenting with different ways of growing these plants, both outdoors and in the greenhouse, and hope to report back as I reap the harvest (or not). On Saturday (a glorious sunny day here in west Wales) I cleared the bed that had contained the potatoes and broad beans and planted six different oriental vegetables: Komatsuna Japanese Greens; Mispoona oriental greens for salad or cooking; Tai Sai White Stem Leaf Pak Choi; Sobi Chinese salad cabbage; Yukina oriental leaf greens; and Hot Mustard Greens. 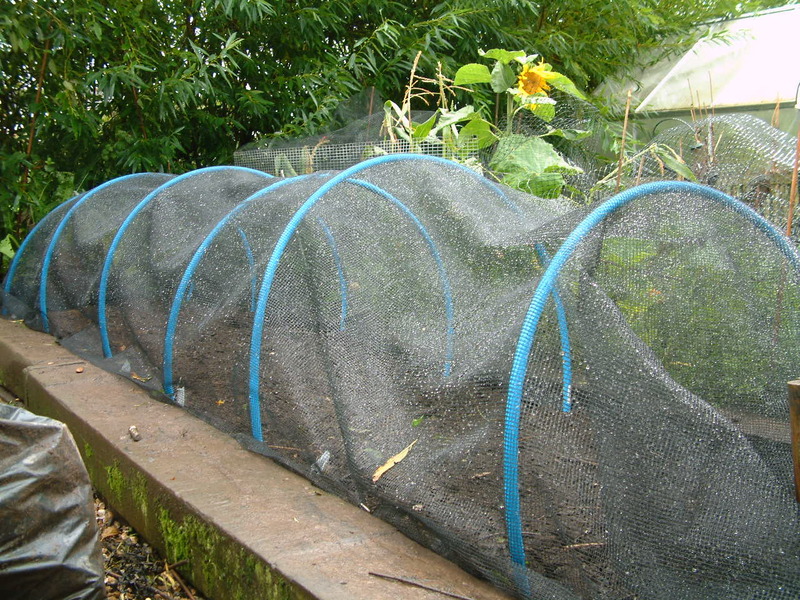 I imagine that all of these would make tasty treats for chickens, so the bed is protected with a net cloche. This structure has hoops made from blue water pipe… a classic material in permaculture gardens, as it’s cheap, readily available and remarkably versatile. As well as keeping rampaging chickens out, the cloche should increase the temperature inside a little (it’s a degree or two warmer in our fruit cage in the winter, believe it or not). Of course, we can always convert this into a more traditional cloche by covering it with polythene, but I don’t think that’s going to be necessary. My next task is to sow some seeds in trays in the greenhouse, so that we will have some completely protected crops too… oh and to settle down and read all of Joy Larkcom’s book (along with the dozens of others that surround me in my office). I grew red pak choi last year. It does very well over winter. You can pick the outer leaves off or harvest te whole plant. I like to chop up the whole plant and put it in soup. I love the idea of preserving produce in new ways. This year I have bottled rhubarb in orange juice and ginger wine… not tasted it yet but I thought that it sounded good. Sadly.our corn failed this year, so corn cob jelly isn’t going to be possible – maybe next year! How did your oriental greens do? I’m currently growing the komatsuna and mispoona and they are doing the best given the weather. The other oriental veg will probably do better later in the season. Mine did quite well. The Mispoona is getting big now. The komatsuna i’ve harvested 1/3 of it as it bolted but it was due to and got nice and big once i started to fertilize them. My tatsoi bolted without getting out of baby stage. But choi sum did well and have sown lots more now the longest day has past. Did the tai sai, yukina and sobi bolt too as i am growing them as well. I had a good crop of mizuna this spring, but building work has put a stop to my gardening for a while… can’t wait to start planting again! I’ve started some purple and green mizuna so hopefully i get to try some of those. I think the ones i started earlier all bolted ridiculously quickly despite the cold weather. That is a shame for you. Maybe use some containers if possible. Most of my stuff is in containers.